First, before I go twisting the night away, you might actually try that dance with one of the tunes from “Bert & Scott,” Friday June 23, from 6:30 to 8:30. They have a wide range of genres, and you might find one that will work. Be careful though, if you haven’t moved your hips like that in a while. Go find yourself an old Elvis movie and try a little warmup period. Now for the fun stuff–at least for a grape geek like me. I’d like to be able to hit on some grape and wine topics that you have wondered about, or find interesting anyway. The “old method” I’m referring to is plant grafting, and in this case specifically grape grafting. I’m going to use the term “grafting” as a loose meaning for grafting and budding. In France in the mid-eighteen hundreds a slow decline was noticed in some vineyards,, and a scientist discovered it to be a root louse called phyloxera, which had been brought in from America, on American grapes. As this decline picked up, the French decided to breed in tolerance from native American wild grapes. The quality was not exactly what they were looking for, and something else needed to be done, and quickly. The answer to the French problem came, for the most part from a Texas grape breeder, T.V. Munson. Munson was much more than a grape breeder, he actually made concise notes on over 1000 native vines. Because it was known that some American species would allow feeding of the phyloxera, it was decided to use them as rootstock for the French grapes, that is, to graft them to the American vines. Munson, with the help of landowners, collected 15 wagon loads of wild grape cuttings to be delivered to France. The French cross-bred these wild vines and some were used as they were, true species. Munson was given the “Legion of Honor” by the French for saving their industry. As phyloxera moved across Europe, growers could be a step ahead, and be ready for the fight. Amazingly enough, there are still places in the world today that the root louse hasn’t obtained a foot hold. 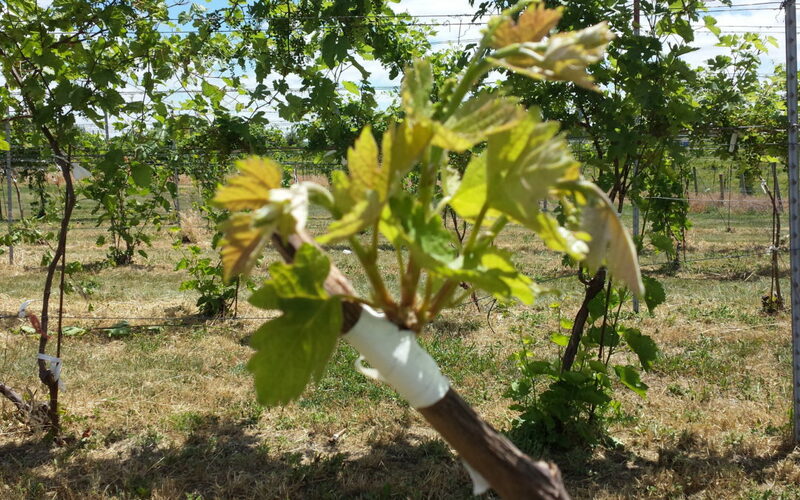 As the grape nurseries have advanced through the years, they have discovered certain rootstocks for specific weather, inherent vigor, length of growing season, and adaptability to certain soil types. Rootstock can be grown in the field and then the fruiting variety–called scion variety–can be “field-grafted,” or the two parts can be “bench-grafted,” in the nursery in the winter months. Okay, now the new twist. As I may have mentioned in a previous blog, I am a grape breeder–we’ll get into that at a later time. Grape breeding is a long term undertaking, and it may take up to 20 years just to get a grape to the point of releasing to the industry. After a new variety fruits for the first time, which may take up to six or seven years, it may only have a few berries. and it’s a bit difficult to make a thimble full of wine. If I’ve decided that this particular vine and its fruit need to be further investigated, I can save dormant wood that fall, and graft it that winter in the nursery, or that next late spring in the vineyard. The method I normally use in late spring is called a “T-Bud.” If all goes well I can take that new varieties wood, keep it in the fridge in the winter, graft it in the spring and have a full crop the following year. This really speeds up the process, and can save me two or three more years of waiting for that new variety to give me enough fruit to test as wine. If I’ve glazed over this too quickly, and something doesn’t make sense I’d love to answer your questions. The two pictures shown here are of a scion variety grafted onto a LaCrosse vine. this is just a single bud saved from last year, and the T-Bud was done on June 8. Let me know what you’re thinking, have a great day.